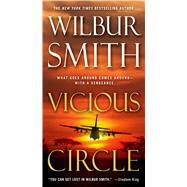 Internationally bestselling author Wilbur Smith returns with Vicious Circle--a heart-racing story of family secrets, greed, and revenge. Hector Cross left behind a career of high risks and warfare when he married his beloved Hazel Bannock. But after his new life is tragically upended, he recognizes the ruthless hand of an old enemy behind the attack. Determined to fight back, Hector draws together a team of his most loyal friends and fellow warriors to hunt down those who pursue him and his loved ones. For he and Hazel have a child, a precious daughter, whom he will go to the ends of the earth to protect. Soon, however, Hector learns that the threat comes not just from his old enemies, but also Hazel's. Brutal figures from her family's past—thought long gone—are returning, with an agenda so sinister that Hector realizes he is facing a new type of adversary. One whose deadly methods and dark secrets will lead Hector to a series of crimes so shocking that he has no choice but to settle the score. Wilbur Smith was born in Central Africa. He became a full-time writer in 1964 after the successful publication of When the Lion Feeds, and has since written more than thirty novels, all meticulously researched on his numerous expeditions worldwide. His books are now translated into twenty-six languages and have sold more than 100 million copies. Please visit www.wilbursmithbooks.com.